Before threading my needle to begin stitching a new design I must first choose an array of threads, decide where to place their different hues along the traced lines, and hope there will be a beautiful marriage of colour and style at the end of my labour. It's not uncommon for me to unpick sections of my work, changing a rich rose for a faded pink or a sea green for an olive shade. I may even pull out a line of backstitch and rework that section in chainstitch, my eyes surveying the overall effect as I go along and adjusting accordingly. Today's Scripture reminds me that God is the Master Craftsman of my life. It is He who must unpick my worldly and selfish ways, and it is He who can be trusted to rework my less than righteous choices - but what He needs is my permission to do so. When I hold tight to the fabric of my life, closing Him off, even pushing Him out - well, gentleman that God is, He won't force His will on me. When I hold Him at arms length and declare, "No Lord, not Your will but MINE be done" then the stitches of my life are clumsy, the colours of my ideals clash and the final appearance of who I am to the world makes no sense at all. Jenny is a mess and everyone knows it. BUT...hold out the cloth that is the background of who I could be and humbly offer it before Him, and now we're talking beauty for ashes. 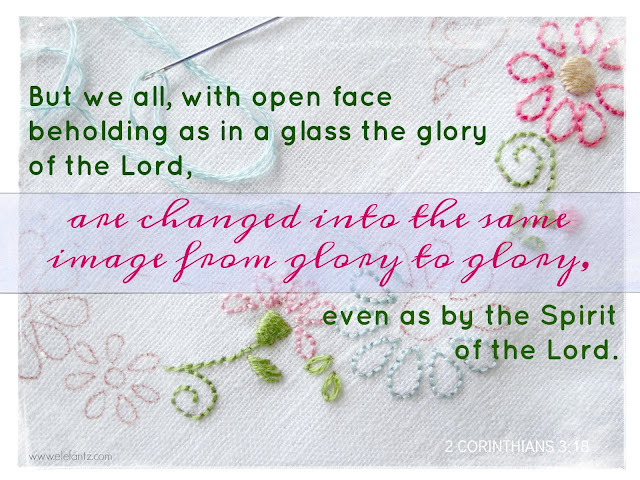 My God makes every stitch count for His glory. My God breathes life into each colour so that it shines with integrity and hope. My God weaves a picture that no man could conceive possible in the life of one lost soul such as I. My God is The Master Craftsman and I desire that He keep stitching my life one lesson at a time, changing me from glory to glory until that blessed Resurrection Day when I meet Jesus returning on the clouds of Heaven! Oh Glory, I get goosebumps just thinking about that day! I pray I see you there, sweet friend. In the meantime, who is stitching your life? Obrigado! Seu post edificou minha vida! Deus é bom o todo tempo ! One of my favorite ideas from scriptures. Thank you for posting this today. Thank you for the wise words and the thoughts you have shared today. So beautiful are your words and your stitches. They give us a glimpse of just how beautiful your heart is, as it is filled with our Lord and Savior, Jesus Christ. Thank you for sharing your heart and stitches with us. May God bless you abundantly today. Hit the mark today...love the post Jenny! Just Beautiful... thank you for sharing! Great thoughts. So cool to think that even though we may never meet here, we will meet in heaven. God is good. The beauty of your words is enormous. They go right to think my conscience and my heart. Jenny thank you very much. God bless you always. I need this! Thanks, Jenny! Thanks for your reflection on this scripture. These are thoughts to reflect on-in fact these are things to think about daily as it is easy to think we are doing okay but without time for reflection we may be fooling ourselves. 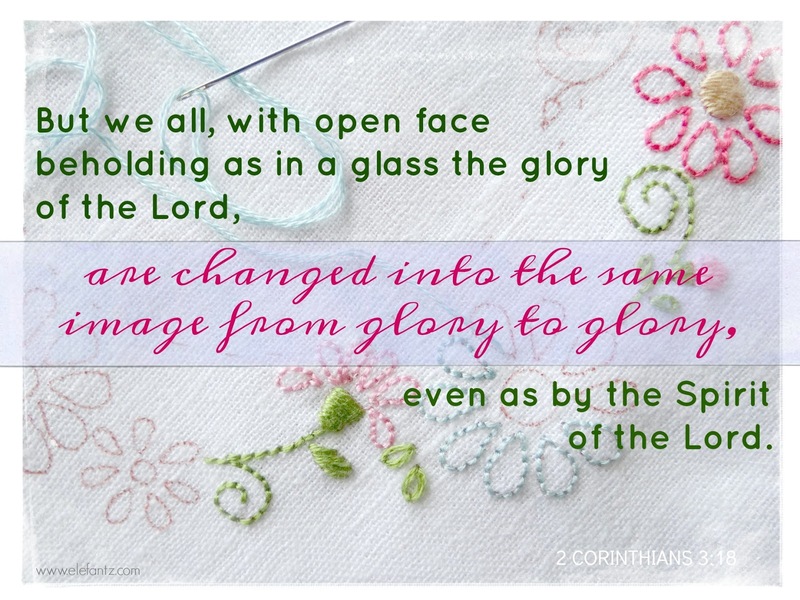 I like the way you use the aspect of working on a stitchery as this provides a concrete way to understand God as a Master craftsman more fully. Thanks Jenny you are a blessing. I love your gorgeous pincushions. My 2 year old grandaughter's name is Poppy so the Poppy pincushion is particularly appealing for me. Hello lovely Jenny. May I have your permission to use this lovely post at a ladies group that I will be hosting tomorrow night? We call it Through Grace and it is an encouragement evening for the Christian Homeschooling mums in my area - a place to connect, refresh, worship, pray, eat cake, drink tea, and know that we are in a place of understanding for the calling that God has placed in our lives. Even though that stage is long finished for me, it is still a place of sanctuary for these precious younger ones coming through. Your words are so gracious and full of wisdom, and I know will be well received and thought provoking. With love in Christ, Maria.